KANSAS CITY, MO. – The Gustavus Adolphus men’s soccer team is ranked No. 25 in the National Soccer Coaches Association of America (NSCAA) Division III Men’s Rankings that were released this past Friday. This is the first national poll released by the NSCAA this season. The NSCAA conducts the most widely recognized national and regional soccer ranking system in the country as a service to the general public and its members. The intent of the rankings program is to stimulate greater interest in men’s and women’s soccer at the intercollegiate and interscholastic levels and to recognize those programs that are enjoying remarkable success on a regional and national level. 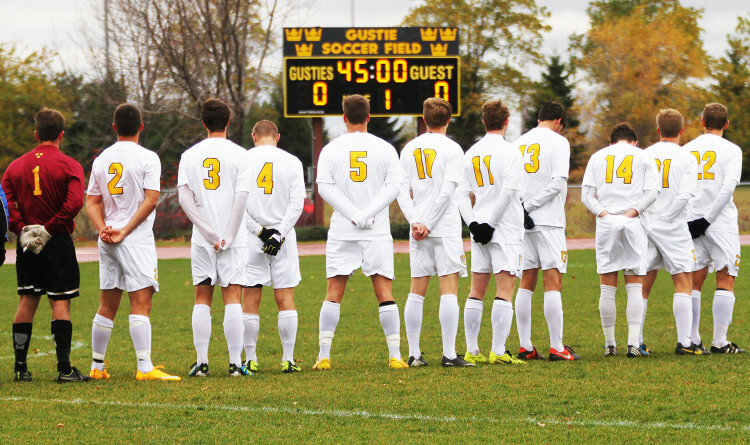 Last season, the Gusties finished in a tie for second place in the regular season Minnesota Intercollegiate Athletic Conference (MIAC) standings, but defeated Saint John’s University 2-0 in the MIAC Playoff Championship game to earn an automatic bid to the NCAA Championships. There, the Gusties earned a 1-0 victory over Dominican University in the tournament’s first round, but fell to Loras College 2-0 in round two. Gustavus will begin its 2015 season on September 1 when it travels to Martin Luther College for a 4 p.m. game.